​Chelsea starlet Callum Hudson-Odoi wants the Blues to facilitate his departure for Bayern Munich this month after losing faith in his development under Maurizio Sarri, with the Bavarians confident on the deal. The young England winger is apparently adamant that he must be allowed to leave Stamford Bridge this week in order to aid his development at senior level, with a £35m switch to Bundesliga giants Bayern Munich reportedly on the table. According to the ​Mail, Hudson-Odoi wants to join the German champions as they attempt to rejuvenate their squad, with veteran wingers Franck Ribery and Arjen Robben nearing the end of their time in Bavaria. The ​Chelsea prospect has seen an increase in his first team involvement under Sarri since ​Bayern’s interest in the 18-year-old emerged with a series of formal bids this month, with the German side said to be keen on Hudson-Odoi featuring prominently in their immediate future. Chelsea, on the other hand, have taken a more cautious approach with their youth academy product since promoting him to the first team. Hudson-Odoi has made just two Premier League appearances under Sarri this season. The youngster’s chances of making an immediate impact in the Blues’ senior setup have suffered a further setback as Chelsea agreed a £58m deal to bring ​Borussia Dortmund star Christian Pulisic to Stamford Bridge in the summer. Competition for places is only likely to increase, with Hudson-Odoi set to be behind the likes of Pulisic, ​Eden Hazard, ​Willian and ​Pedro in Chelsea’s attacking ranks from next season. 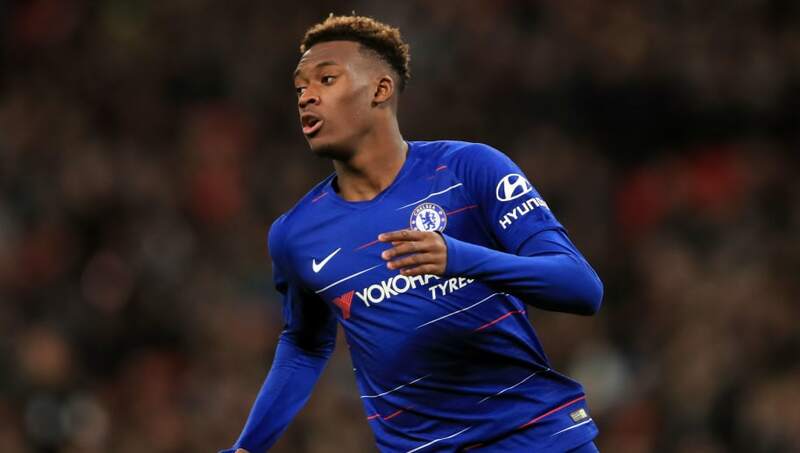 Chelsea are said to be keen to keep hold of one of their brightest young prospects and have apparently urged Hudson-Odoi to commit to the new five-year deal that is on offer from the Blues. Callum Hudson-Odoi is coming on. If he is to live up to the hype, I expect no less than an assist, two goals, and a solution to Brexit. However, it is said that the winger is increasingly unlikely to agree to a new deal, with his current contract set to expire at the end of next season. According to a further report from the ​Mail, the situation has left Bayern confident of luring the youngster to the Allianz Arena. It is said that the Bundesliga champions are poised to seal a deal for Hudson-Odoi, having finally agreed to Chelsea’s demands of including a buy-back option in the deal to take the winger to Bavaria, giving the Blues first refusal should Bayern decide to sell in the future. The agreement would apparently include a sell-on clause in the event that Bayern sell to another team further down the line, through which Chelsea would receive a certain amount of the transfer fee that Bayern recoup for the forward. A further issue in concluding the deal is said to be Chelsea’s reluctance to lose Hudson-Odoi this month, with Sarri having to deal with a shortage of attacking options which suit his style at Stamford Bridge. With the starlet clearly a player the Italian coach rates highly, a likely outcome could be a deal which sees Hudson-Odoi allowed to depart Stamford Bridge in the summer rather than in the current transfer window.